Epcot - the quiet park - Never!! The number of attractions in Florida is staggering and when visiting Florida (particularly for the first time), it can be quite overwhelming. 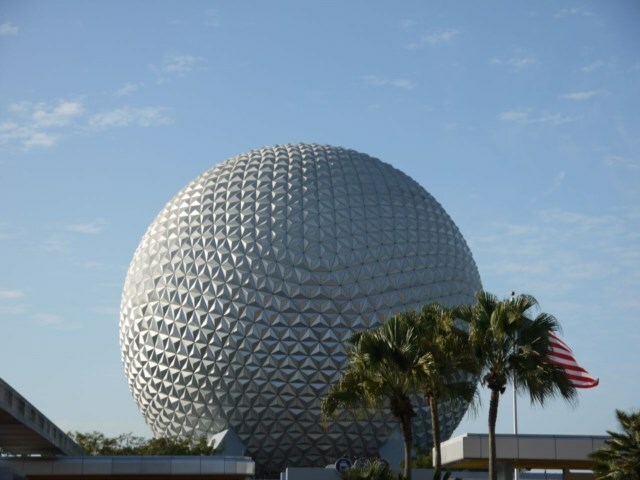 If you invest in a ‘park hopper’ ticket available at the best prices from the link on this site, then you will have a good chance of making the best of what is on offer at Disney. Most of the parks appear to be very showy and Epcot can seem to be a little less attractive with few rides but don’t be fooled! Only Disney can take you right around the world in a day! It is well worth taking a little time the night before researching a guide map (most of the villas in Florida will have one of these provided). 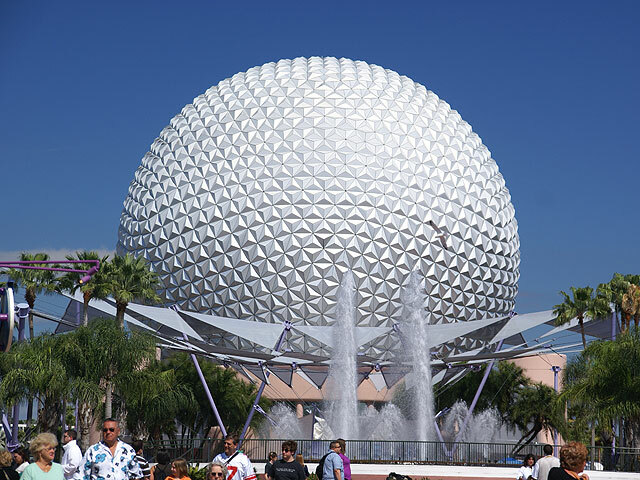 It is a VERY large park, split into two main segments, Future World and World Showcase, which is set around the outskirts of a beautiful lake. 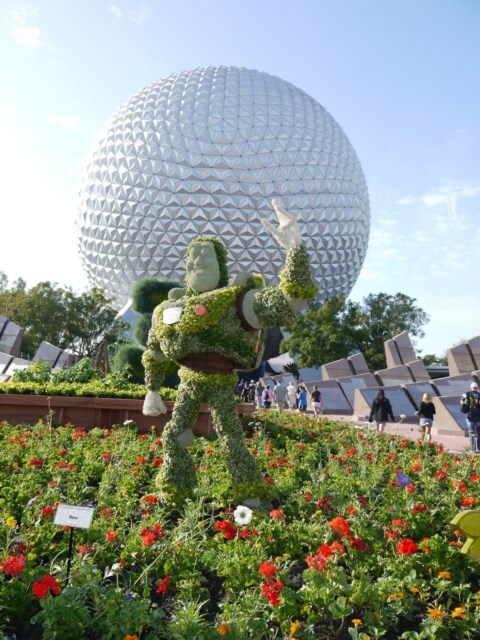 If you are expecting a day full of big rides & thrills then it may at first appear a little disappointing as Epcot does focus more on education but none the less has something for all ages. What scary rides there are are in Future World & its well worth getting Fast Passes, as they are very popular. The newest is Mission Space – an extremely realistic simulator space ride – so realistic that they provide airsickness bags!! It is the closest thing you will come to actually experiencing the G-force conditions felt when taking off & flying in space. Inside the Epcot ‘world ball’ is a slow moving ride taking you on a journey through time explaining telecommunication systems from past to future. A bit heavy you may think for a holiday ride but it is an enjoyable 15 minutes & a good opportunity to catch a breather in the shade. There are several other exhibits, which are fun & educational at the same time, many interactive. The other ‘must-do’ ride at Epcot is again in Future World – Test Track. 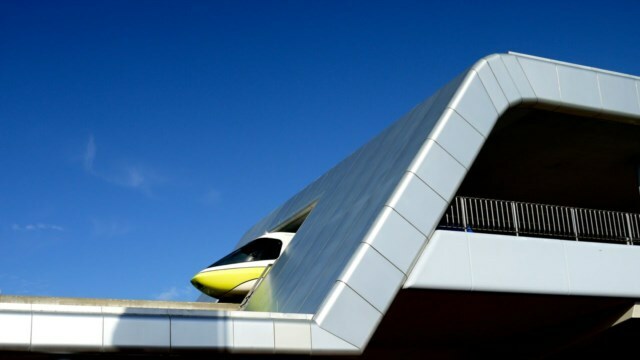 This is a high speed & thrilling ride where you experience the sensations of vehicle test track conditions at up to 60 mph, including hot & cold temperature checks. Definitely not to be missed! In this pavilion is also a display of some of the latest car models available. World Showcase focuses on the cultures of varying countries from Ireland to Canada and from Mexico to Japan. As with all things Disney, the settings of the various ‘countries’ are absolutely breathtaking & each ‘country’ features its own shops selling typical goods. Mexico has a water ride which takes you on a tour of the country through underground caverns & where you pass tourists enjoying the peaceful, candlelit cafes by the waters edge. Outside the ‘temple’ Aztecs put on colourful shows of music & dance. Norway features a cobbled town square with delightful shops. Also there is the Troll ride – another water based ride with a few surprises! And don’t miss the opportunity to dine at Akershus, the authentic Norwegian restaurant serving a true buffet of salmon, seafood, salads, cheeses and daily chef selections. Try to leave space for the delicious deserts if you can! On to China where you can view a 360-degree show, sample Chinese cuisine & watch the amazing young Chinese acrobats. Don’t miss the architecture of Germany or Italy or Colonial America or the pagodas of Japan (not to mention the Sushi!) Morocco is a little world of courtyards, shops and street markets where again you are likely to encounter street performers. France has many peoples favourite restaurants & there’s more music in Canada. United Kingdom has an impressive array of historical architecture & street theatre & you may want to stop for fish & chips - oh, & maybe a typical English pint of Beer!! If you are lucky enough to be at Epcot on one of the selected days you should definitely stay to see the World Showcase Promenade – Epcots’ parade at dusk with giant stilt-walking creatures dancing to vibrant music. Then on selected evenings at nightfall is “IllumiNations” - Wow! It is worth trying to position yourself near the waters’ edge although it is possible to see the fireworks from most places. The park becomes silent as you wait for the show – and what a show! Lasers draw pictures on the giant ‘world’ which glides out across the water whilst brilliant fireworks, dancing fountains & fiery torches perform to the incredible music. At the finale all the different countries are lit up beautifully, creating a magical, special end to what is a truly remarkable day. 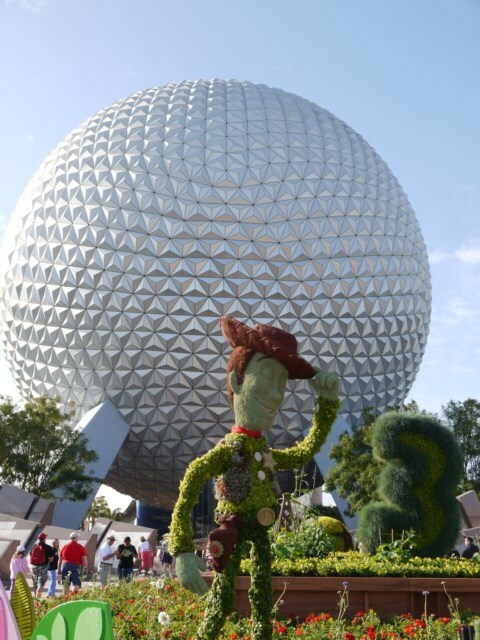 Epcot – the quiet park? Never!! Viewed 3557 times since 1 September 2008.